Positing a radically new understanding of the root of conflict—unmet needs—this analysis boldly directs students and teachers to recognize feelings as important messengers of those needs. Refocusing attention from feelings to the needs behind the feelings addresses the underlying problem rather than the symptom; with this objective, the concept of the “No–Fault Zone" is introduced. It is a place in the classroom free from criticism or blame where students learn trust and respect for one another, develop successful conflict-resolution skills, and the responsibility for resolution shifts from teacher to students. 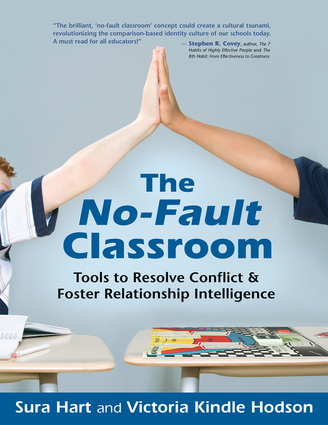 The complete conflict resolution curriculum is included, providing step-by-step guidance and making this classroom kit a time-saver for busy teachers. Sura Hart and Victoria Kindle Hodson are co-authors of Respectful Parents, Respectful Kids; The Compassionate Classroom; and The No-Fault Classroom—all based on Nonviolent Communication and translated into numerous languages. In addition, Victoria and Sura have developed The No-Fault Zone Game—a communication and conflict resolution tool used in homes and classrooms throughout the world. Sura Hart is an educator, author, and certified trainer with the international Center for Nonviolent Communication and worldwide leader in the incorporation of the proven process of Nonviolent Communication in school communities. She offers Compassionate Classroom and No-Fault Zone workshops and trainings throughout the world—in the United States, Canada, Europe, Central America, Australia, and China. When not traveling, Sura makes her home in Seattle, Washington, where she enjoys spending time with her family and coaching educators and parents in collaborative communication skills and restorative conflict resolution. Victoria Kindle Hodson, teacher, consultant, and internationally recognized author, is a passionate proponent of respectful interactions between adults and young people. For four decades, she has been sharing compassionate practices from the fields of parenting, education, positive psychology, and brain science with thousands of parents, teachers, and students. Victoria lives in Ventura, California, where she is currently training teachers in The No-Fault Zone curriculum, designing professional development programs for personalizing classroom instruction, and working with private clients.